Summary Extremely dumbed-down AC1900 class router built by TP-LINK and powered by a Google OS. By now, I'm sure you've read many reviews of Google's first OnHub device manufactured by TP-LINK. In case you've been in a coma for the past few weeks, OnHub is an AC1900 class Wi-Fi router running a Google OS based in part on Gentoo Linux. In addition to its 3x3 2.4 and 5 GHz radios, there's a dual-band 1x1 radio dedicated to monitoring Wi-Fi activity. Also inside are Bluetooth 4.0 and 802.15.4 / ZigBee radios that will be turned on sometime in the future. The presence of these radios and the mention of future support for the Thread networking protocol and Brillo OS and Weave IoT protocol lead many observers to regard OnHub as a work-in-progress smart home hub. Among OnHub's other hardware features are its single Gigabit Ethernet LAN port, into which many buyers will need to plug a switch to connect more wired devices and a USB 3.0 port that, like the Bluetooth and ZigBee radios, currently isn't enabled. There is also a speaker, whose only purpose at the moment is to aid setup using the Google On Android app. The speaker emits a series of tones that the Android device receives to complete the link between them. 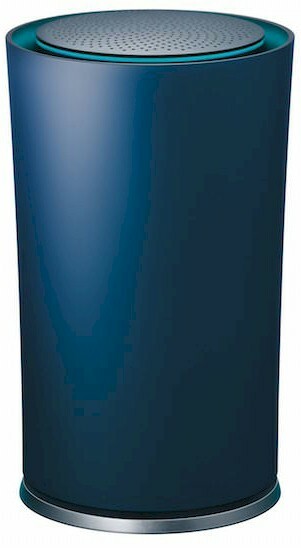 Although the OnHub and Amazon Echo have similar cylindrical form-factors, the OnHub has no microphone. The top of the OnHub has a light ring used to communicate status. The ring also contains an ambient light sensor. The use of colors and flash patterns to communicate status is pretty old-school and puzzling, considering the focus on user-friendliness Google put into the Google On app used to control OnHub. Why not use the speaker to just tell the user what's up? The OnHub was a difficult critter to take apart. Removing the outer shell was the easy part, once I figured out that it had to be turned counter-clockwise to release it. (Note to Google: please make this critical piece of information more prominent in the setup instructions.). After much trial and error and some snap-crackle-and-pop while removing the inner plastic housing, I was finally able to get to the goodies. It's no secret that the OnHub is powered by a 1.4 GHz dual-core Qualcomm Atheros IPQ8064 internet processor, under the heatsink at photo right. OnHub's specs also disclose 1 GB of DDR3 RAM and 4 GB and 8 MB of flash memory. The processor is also found in the Linksys EA8500 and Amped Wireless RTA2600 QCA-powered second generation 4x4 AC2600 class routers. The photo below has the RF can top removed. The two QCA9880 3x3 802.11ac radio SoCs are thermally coupled to the can lid via pads. The massive heatsink you may have seen in the Verge's OnHub coverage actually covers the bottom of the main board. It's coupled to board areas under the IPQ8064 processor and QCA9880 radio SoCs to provide additional heatsinking. The whole board assembly is bolted to the aluminum base for even more thermal mass. The OnHub does indeed have 13 antennas for Wi-Fi. Eleven of them are found on six boards evenly spaced around the OnHub's top. The twelfth is a large 7 dBi sheet metal antenna attached to the inside of the OnHub front cover. This is the 2.4 GHz antenna that OnHub's specs describe as having a "specialized reflector...that acts like a satellite dish". The reflector is actually the flat part of the heatsink shown above. The thirteenth antenna is a dual-band positioned over the speaker that serves the dual-band QCA9882 1x1 802.11ac monitor radio. Each board has two antennas, one each for transmit and receive. The rear-facing 2.4 GHz antenna is a bit different; one of its antennas connects to one of the three 2.4 GHz radio chains, while the other connects to the ZigBee radio. Finally, the Bluetooth 4.0 radio's antenna is etched directly onto the main board. A helpful reader tipped me to component information contained in the FCCID test report. The table below summarizes the antenna complement and gains. The gallery below has more construction pictures, along with commentary. View with covers removed, showing the massive heatsink. This is actually on the back side of the main board, thermally coupled to the board under the processor and two radio SoCs. The flat area is the reflector for the 2.4 GHz 7dBi antenna. Here's the 7dBi 2.4 GHz antenna. It is positioned at the front of the OnHub. Closeup of the monitor radio (left), Bluetooth and ZigBee radios. The Bluetooth antenna is etched into the board right edge. The mini RF connector near it is for testing purposes. The speaker and LED assembly. The ambient light sensor is photo left, surrounded by a square light baffle. The dual-band monitor antenna sits right below the top speaker grille. Moving clockwise, showing 2.4 GHz Chain 1 (left) and 5 GHz Chain 2 (right). Again clockwise, showing 5 GHz Chain 0 (center) and 2.4 GHz Chain 2 (left). Last pair, 5 GHz Chain 2 (left), 5 GHz Chain 1 (right). Top view of Wi-Fi antenna array. Antenna list from FCC ID test report. WiFi radio component list from FCC ID test report. The table below summarizes the major components for the OnHub and two other popular AC1900 class routers, NETGEAR's Broadcom-powered R7000 Nighthawk and Linksys' Marvell-based WRT1900AC.